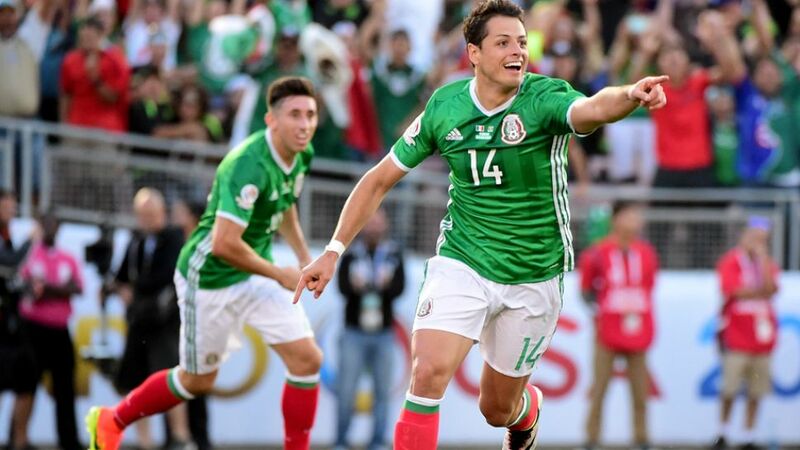 Javier 'Chicharito' Hernandez moved to within one goal of equalling Mexico's all-time scoring record of 46 when he netted the opener in El Tri's 2-0 victory over Jamaica at the Rose Bowl stadium in Los Angeles. After Uruguay's loss earlier in the day, Mexico knew that victory here would ensure them safe passage from Group C into the Copa America Centenario knockout rounds. They started brightly and soon got the goal their pressure deserved when Chicharito found a pocket of space inside the box to guide a superb header into the bottom corner. Chicharito's girlfriend, Lucia Villalon Puras, is blogging exclusively for bundesliga.com at the Copa America. Watch the video below for a sample and click here for more! Jamaica were not without chances of their own, however, and Mexico had goalkeeper Guillermo Ochoa to thank for preserving their lead. Chicharito went within a whisker of adding his second of the evening from close range but just failed to connect with a cross from the right. The Bayer 04 Leverkusen forward was substituted off to a huge standing ovation in the 78th minute, just moments before his replacement, Oribe Peralta, scored Mexico's second to seal their place in the last eight. Click here for the match in pictures.